An upper air circulation brought on by western disturbance caused hailstorm in parts of eastern Rajasthan, Madhya Pradesh and Uttar Pradesh on Wednesday. Lightning due to severe weather claimed six lives in Mathura, Aligarh, Allahabad and left over a dozen injured. As per initial reports, hailstorm was reported from Bharatpur, Alwar, Jaipur and Sikar in Rajasthan. Available Doppler radar images taken on Wednesday afternoon indicated more incidents of hailstorm in isolated areas of east and north-east Jaipur. Following hailstorm, temperatures dipped in Jaipur. The pink city recorded 21.7 mm rainfall on Wednesday and the minimum temperature touched 12.6°Celsius, 4°Celsius below normal, on Thursday morning. The Bundelkhand region of Madhya Pradesh was severely affected. Areas like Ashoknagar, Shivpuri, Khurai, Malthon, Damoh, Chattarpur, Dabra, Gwalior, Anchal Kheda, Sevda and Datia witnessed severe hailstorm on Wednesday. Coin-sized hails fell for a long time in many areas of the state. Here also, temperatures registered a dip. Jhansi, Mathura, Aligarh and Baghpat districts in Uttar Pradesh witnessed hailstorm mostly on Wednesday afternoon. Heavy rainfall was reported from Jhansi, Lucknow, Kanpur, Farrukhabad and Banda. Strong winds uprooted several trees and electric poles as a result of which telecommunication and power supply were disrupted. Jhansi’s maximum temperature on Wednesday touched 22.1°Ceslius, registering a departure of -10°Celsius from normal. 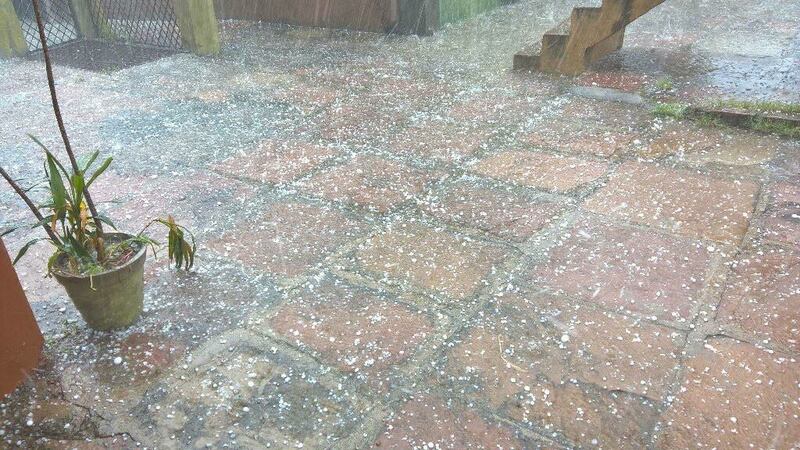 According to weather experts, hailstorm at this time of the year is not a normal phenomenon. If one looks at the climatological table (1971-2000) of these places, the mean number of days with hailstorm in October is zero. What is even more striking is that as per climatology, Jhansi never gets hailstorm (the mean number of days with hailstorm is zero for all months). However, observations clearly suggest that hailstorms are becoming more and more frequent. Since 2011, parts of Rajasthan such as Sikar and nearby areas have been experiencing hailstorm practically every year in the January-April period, but perhaps it is for the first time that it occurred in October. Some amount of rainfall will be beneficial for Rabi crops at this time. According to Bharatiya Kisan Union general secretary Anil Malik, hailstorm at this time of the year will prove to be beneficial for Rabi crops. “It would have proved disastrous if the hailstorm had occurred during February and March,” he said. N Chattopadhyay, deputy director general of meteorology (agricultural meteorology), India Meteorological Department, said as the Rabi sowing period is going on, Wednesday’s rains in parts of Uttar Pradesh and Madhya Pradesh will be beneficial for agriculture. Such rain helps in increasing soil moisture which is very important for proper growth of crops. However, strong winds and hailstorm have reportedly damaged standing crops and vegetables in Madhya Pradesh and Uttar Pradesh. Some areas in these two states have witnessed back to back hailstorms since the past few years. Several areas of Madhya Pradesh were badly beaten by hailstorm during March-April this year. Crop damage is a bad news for drought-hit farmers. This year, the south-west monsoon brought scanty rainfall in eastern Madhya Pradesh and Uttar Pradesh. The eastern part of Madhya Pradesh received 29 per cent below normal rainfall this time, eastern Uttar Pradesh received 47 per cent below normal whereas western Uttar Pradesh received 43 per cent below normal rainfall. Doppler radars play a vital role in detecting lightning and hailstorm. Based on these detections, people can be warned well in advance about such occurrences. Hence, for an efficient forecasting, there must be a high coverage of these radars. United States has an extensive grid of about 155 Doppler radars as against just 16 in India. Out of these 16, three (in Hyderabad, Lucknow and Nagpur) are non-functional at present. Big states such as Madhya Pradesh and Uttar Pradesh have just two radars in Bhopal and Lucknow respectively. These installed (S band) Doppler radars work best only within a radius of 250 km. As Lucknow’s radar was non functioning on Wednesday, most areas in Uttar Pradesh (where both hailstorm and lightning were reported) were out of coverage area. Even Bhopal’s radar could not properly track hailstorm beyond its 250-km range. In north-central Madhya Pradesh, large areas were out of coverage because of their distance from Bhopal’s radar. Last year during February-March when severe hailstorms hit many parts of India, more than half of the Doppler radars in India were not working. Some of them were broken like Nagpur’s radar and others were undergoing maintenance. Thus, India has a long and unfortunate history of “out of order” radars. India is not a weather-ready nation. As per records, lightning strikes killed over 2,500 people in India in 2014 as compared to 26 in the US during the same period.